Pizzelles.. they are the quintessential Italian treat that look wonderful plated at an elegant dessert table with it's beautiful floral lace pattern and it's crisp texture. It is a quick an easy cookie to prepare that is the talk of the room at many school parties or family get-together's. The traditional recipe calls for anise and anise seeds..yes, like my Spungna Di Biscotti Cake.. but also like the Biscotti, it works well with many flavorings. During the holidays I'll give Pizzelle cookies as gift's, side-dipped in a chocolate coating and for more of a festive look sometimes sprinkled with fine glittery candies. and according to my husband, addictive. In a large bowl, beat together the eggs and sugar. Add the butter, vanilla, and amaretto. Add the flour and baking powder and mix well. The batter should be stiff enough to be dropped by spoon. The batter can also be refrigerated for later use. Sift the flour, baking powder, and cocoa together in a bowl. In another bowl, whisk together the butter and sugar. Add the eggs, milk, and vanilla. Whisk until combined. Add the flour mixture and blend until smooth. 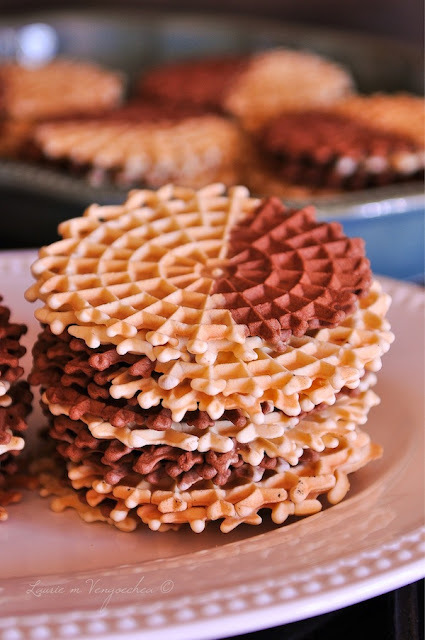 *Heat the pizzelle baker and follow the directions for How to Make a Pizzelle. Put half a teaspoon of each, cocoa and amaretto, side by side onto the iron to achieve the two toned affect. It takes practice.. but the result is beautiful and delicious! These are so beautiful! I tried baking cookies yesterday and took pics but the lighting didn't turn out so god. What size lens did you use? Homemade pizzelles are some of the best things on this earth and the store-bought version just doesn't stand a chance! I haven't had them in years, but these two-toned ones look so good. I mainly use a Nikkor 60mm 2.8 macro lens and Nikkor’s 24-70 mm 2.8. I shoot wide open.. which means I set my ISO to 2.8 to maximise the lighting. I'm looking to purchase the Nikkor 50mm 1.4.. it is an extremely great lens for shooting in low light conditions. Nice! I have a big problem with lighting. My camera is fuji and it takes pictures in low light conditions and makes them grainy. I will try changing the ISO to 2.8. Thank you! oops Alexandra.. I meant the aperture ring to 2.8..
No Problem! I will try changing aperture then, and the ISO. Thank you for the information! What a great idea...I never thought to make two toned pizzelles. Beautiful! 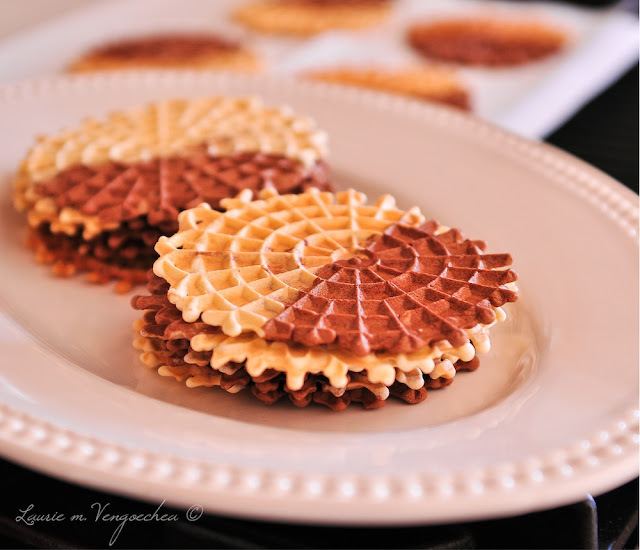 !Am so fascinated by these cookies that have requested someone to send a pizzelle maker from the US!! Laurie which dessert can be combined with these cookies? ?